Concerto For Gabriella, "Gabby", is the heart of White Pine. She was purchased shortly after we lost our first puppy to seizures. 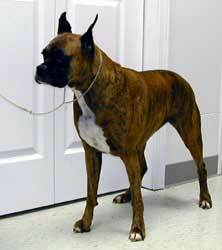 Gabby in no way reflects the boxer standard but we love her and she will always have an important role at White Pine. She is always curled up next to me on the couch or trying to get under the covers of the bed. She has become "Grandma" to all of the puppies, the first to play with them and the first to discipline them when they get into trouble. Gabby will always be part of our lives. Gabby was born 1/12/99 and passed 10/28/08. 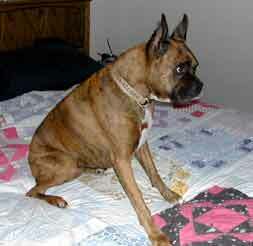 She died of hemangiosarcoma which is a cancer that affects and travels through the blood vessels. "We love you Gabby"